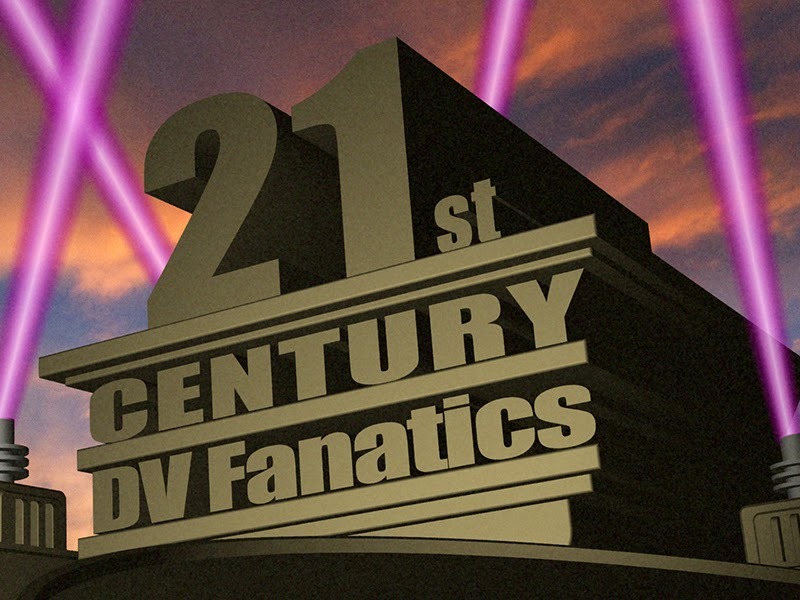 Creating a film open similar to 20th Century Fox. This week we'll talk about creating another film open. Back in December of 2012 we discussed recreating the MGM lion in the Dissecting the Video: MGM-Style Film Open blog. This week we'll recreate the 20th Century Fox film open. We'll be using Adobe After Effects CS6 to create this (I haven't gone to Adobe Creative Cloud yet because of My Problem with Adobe Creative Cloud). Although this would be easier to create in a dedicated 3D modeling application, I'm using Adobe After Effects because it's a tool I have available on my system. Start off by creating a new comp, the comp I created is 20 seconds long. 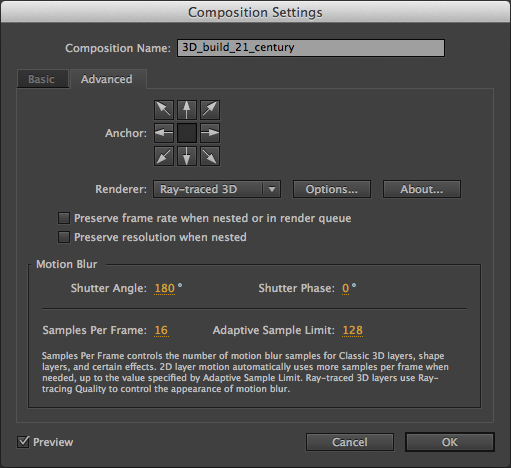 Under the ADVANCED tab of the COMPOSITION SETTINGS, make sure RENDERER is set to Ray-traced 3D. This will allow you to extrude your shapes, but will drag slower computers to a halt. I call the first comp 3D_build_21_century, this includes all of the text objects. Make sure 3D layer is enabled for all of the layers in each of these object comps. I used Impact as the font for all the text objects. Between each TEXT object is a SHAPE object, each SHAPE object has varying width and extrusion. The EXTRUSION DEPTH is adjusted under the GEOMETRY OPTIONS of each shape. I chose an EXTRUSION DEPTH of 450 to 490, depending on the shape. All of the TEXT objects were extruded to 450, while the wider SHAPE objects were set to 490 and the rest of the SHAPE objects were set to 470 for EXTRUSION DEPTH. The layers of the 3D_build_21_century comp. The next object I built was in a comp named 3D_build_light_tower. These are the small structures that will appear on either side of the 3D_build_21_century comp. The 3D_build_light_tower consists of all SHAPE objects. This was built as its own comp so that it could be built once and used twice - on either side of the 3D_build_21_century comp. The last object is the plate-shaped object in the foreground. I named this 3D_build_foreground. For this comp I used an Ellipse shape and a ring shape that I imported from Adobe Illustrator. The ring shape was to give this shape a raised ridge at the top. To enable this imported shape to be extruded, I first needed to convert it to a SHAPE object. This is done by dropping the Illustrator file into the comp, right-clicking on it and choosing Create Shapes from Vector Layer. This created a layer in my comp called ring Outlines. I set the EXTRUSION DEPTH of this object to 500. The Ellipse shape (center_fill) acts as a cap so the ring Outlines layer isn't just a hollow cylinder. I set the ANCHOR POINT of center_fill to -7, this places it just below the top of the ring Outlines layer. Now that we have all of the 3D elements, we need to build the final comp. Next week we'll talk about combining all of the different elements and adding animation in "Dissecting the Video: 20th Century Fox Open (Pt 2)". Below is a rendered version of the final comp.